If your kids play sports, you’re going to need a few game day recipes to fuel them up and give them that extra competitive edge! 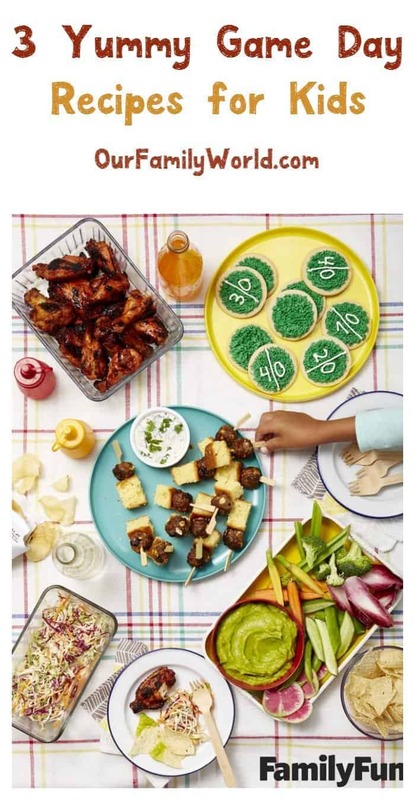 You’ll also need plenty of yummy foods for those big celebrations after a fantastic match! One of our favorite magazines, FamilyFun Magazine, shared some of their favorite ideas that aren’t just delicious, but also help get kids involved in the kitchen. We’re big fans of teaching children the basics of meal prep at a young age. The bonding experience alone of working together to create a delicious recipe is absolutely priceless. Read on for some delicious game day recipes that you can all make together! Do you have any favorite game day recipes that you love to make with your team? Share in the comments! Affiliate links included below. Thank you for your support! Kids will love rolling up these tasty bites that pack in all the flavors of chili—no bowls and spoons required! Heat oven to 350°F. Prepare two baking sheets with parchment paper. Combine ground beef, egg, beans and liquid, corn, cheese, chili seasoning, and salt in a large bowl and mix thoroughly. Roll meatballs about 11⁄2 inches in diameter and place on prepared baking sheets. Bake for 25 to 28 minutes until cooked through. 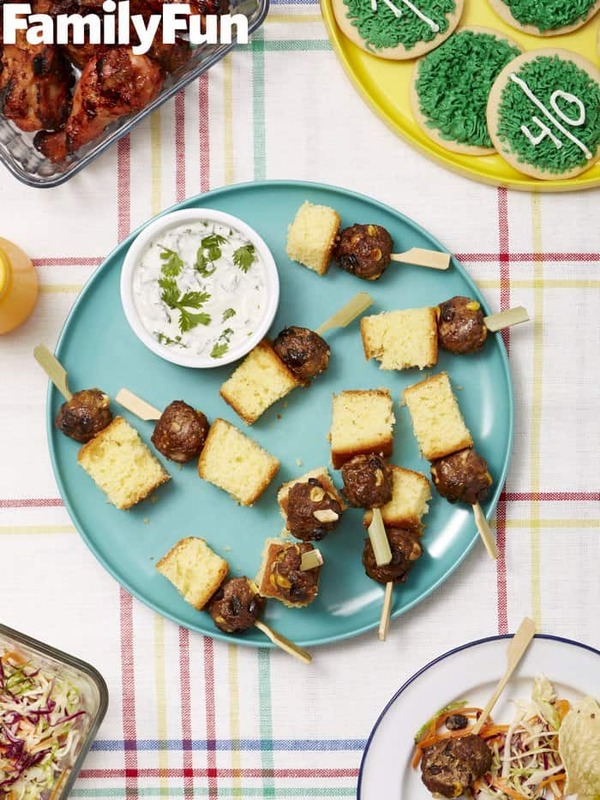 Cut cornbread into 2-inch squares and thread onto skewers with meatballs. Mix sour cream with cilantro and serve. Decorated with frosting “grass” and white yard lines, these semi-homemade treats are fun for kids to make and eat! Flatten dough into a disc and wrap in plastic wrap. Chill for 15 minutes. Cover 2 sheet pans with parchment paper. Remove dough from refrigerator and roll out to about 1/8-inch thick on a floured surface. Cut out circles using a 23/4-inch cookie cutter . Combine scraps. Reroll dough and cut more rounds. Transfer to a baking sheet and bake for 12 to 15 minutes until done. Let cool. Dye half the frosting green. Fill a piping bag, fitted with the #233 grass tip, with the green frosting. Fill a second piping bag, fitted with a #4 round tip, with the remaining white frosting. 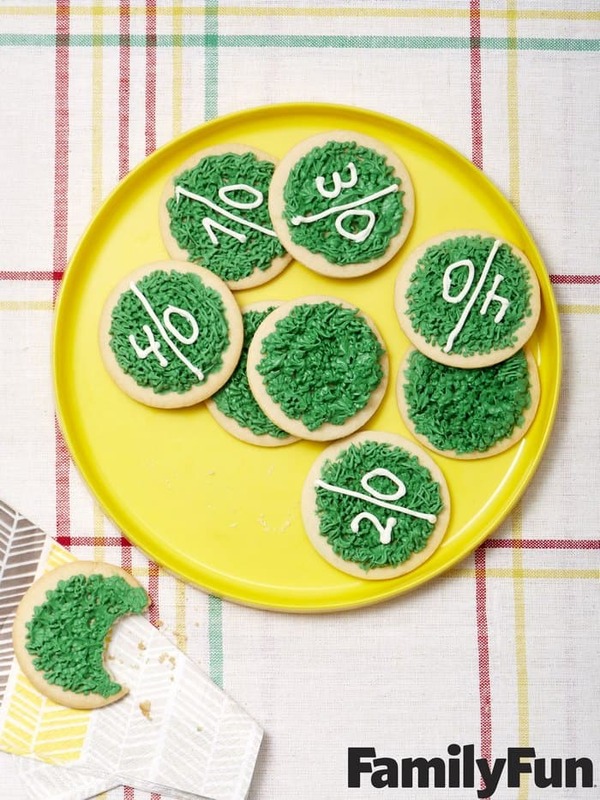 Show the kids how to pipe green frosting “grass” on the round cookies, then use the white frosting to add yard lines and numbers. 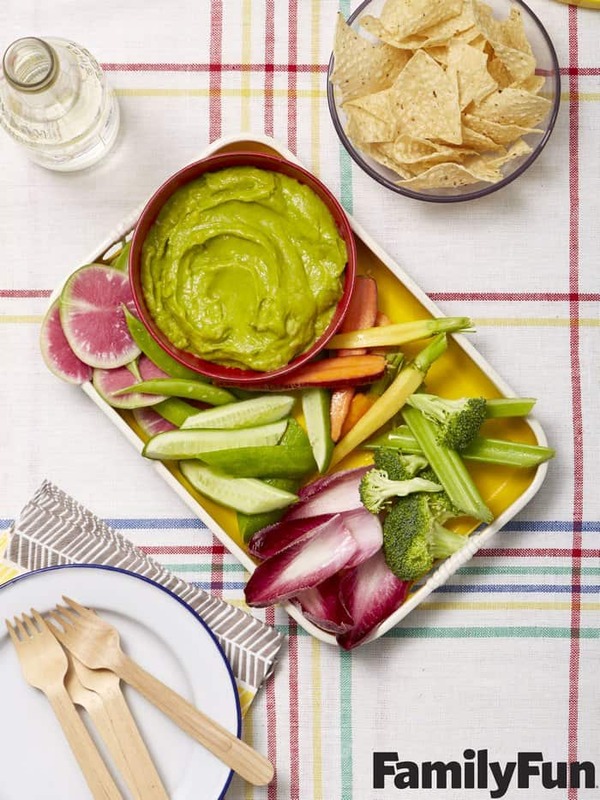 Kids will want to dip just about anything in this awesome sauce. In a bowl, combine milk and lemon juice and let sit for 10 minutes. Serve with assorted raw veggies. Best Christmas Events Throughout the U.S.
My goodness, these are some great suggestions for the game day to make sure kids are excited with those delicious foods. I am in love with those cookies and the Chili Meatball Skewers is a great one as well! These are some great game day recipes to make for kids. I love the idea of the chili meatball skewers along with these awesome cookies. The cookies the kids would have fun decorating. Thanks for sharing the recipes. We should never forget the kids during game day! We definitely should make it fun for them as well. These snacks are awesome, they’ll love it for sure! Those meatballs sound really yummy!!! I don’t think I can wait till game day.